Cquartz Classic (TI02) - Montreal car detail,paint correction,headlight restoration,leather treatment,interior shampoo,wax,sealant. 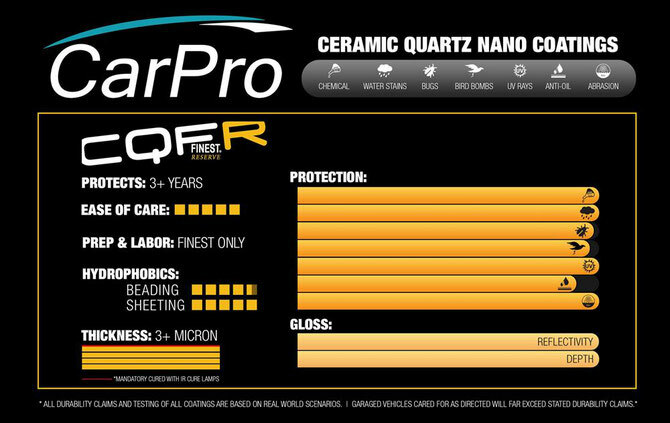 Cquartz Ti02 bonds to paint, glass, metal, and plastic at molecular level, effectively becoming a functional element of the vehicle’s surface. This incredible coating excels in high UV environments, protecting against UV damage, industrial and organic fallout, bugs, and oxidation for up to 2- years, all whilst making it easier to clean than even before. Cquartz UK excels incredibly well in harsh or salty environments. 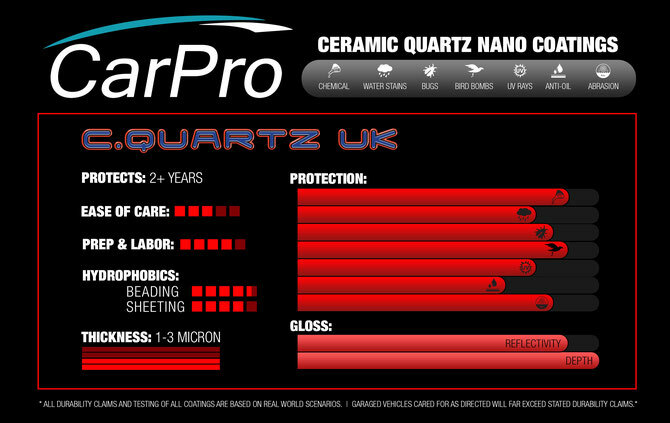 Cquartz UK outperforms a wide array of competitor products all across the world! With an extremely high 70% Si02 content it cures to provide a dense, highly resistant protective coating. 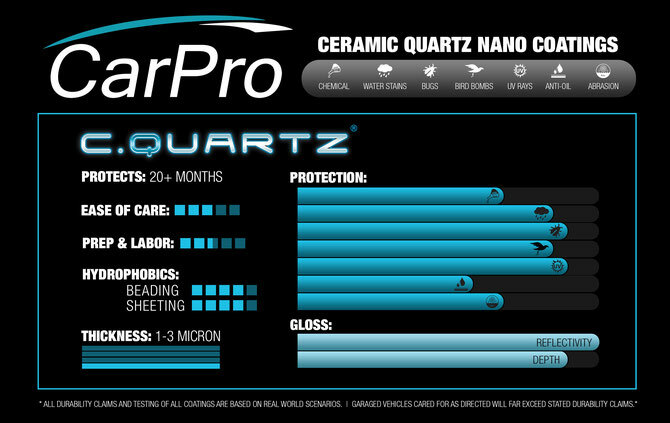 Cquartz Professional harnesses the power of advanced nanotechnology. Each silica (quartz) atom has multiple fluorocarbon molecular bonds, which create a high-density 3D structural coating matrix. 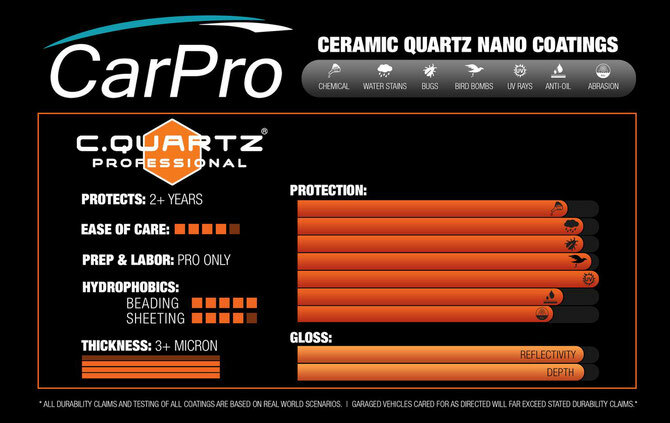 Once bonded and cured to the surface of your paint, Cquartz Professional forms a dense, durable coating that protects the paint and retains a high gloss for years to come! Finest Reserve utilizes an entirely new technology built on complex hybrid blend of quartz infused epoxy nanotech particles. This Next-Gen tech utilizes an advanced hybrid composition, which bridges the gap between ceramic and organic materials, with advances in a variety of attributes and unlike anything that has come before it! Cquartz Finest Reserve provides a rich finish impervious to all oxidative elements and resistant to many stains and spotting issues which are prevalent elsewhere.